Hands to Hands, Too was also collected from music teachers, this time from Canada and the USA. 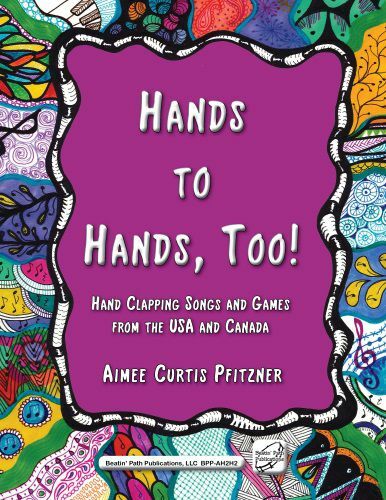 Many have original clapping games invented by Aimee with the help of her students. These hand clapping games are universal, some are familiar, some are brand new. Rhythmic play with songs and chants is the instinctive music language of children. This collection too, is filled with high-energy and engaging materials all ages will enjoy. Each song and clapping game is engraved with unique body percussion notation making it easy to prepare activities for students. Formations, dance steps, or other special instructions are included in each song and game. Supplemental materials are available on this website. Purchasers may request login information to access the download site. Included are full color visuals suitable for presentation stations and links to videos of children playing of many of the games as well as "How-to" videos from Aimee for some of the more complicated clapping patterns.